share your last applied researches and initiatives on IoT to the IoT Week 2019 participants. Following the successful experience of the last IoT Week edition, a special and dedicated Exhibition Area will be available for exhibitions within the Foyer in the Concert Hall Aarhus. Tofoster networking and interaction, all the coffee breaks during all four conference days, will take place at the Exhibition Area. We will offer up to 70+ exhibitor booths, enabling a priority access to the IoT Week 2019 partners. 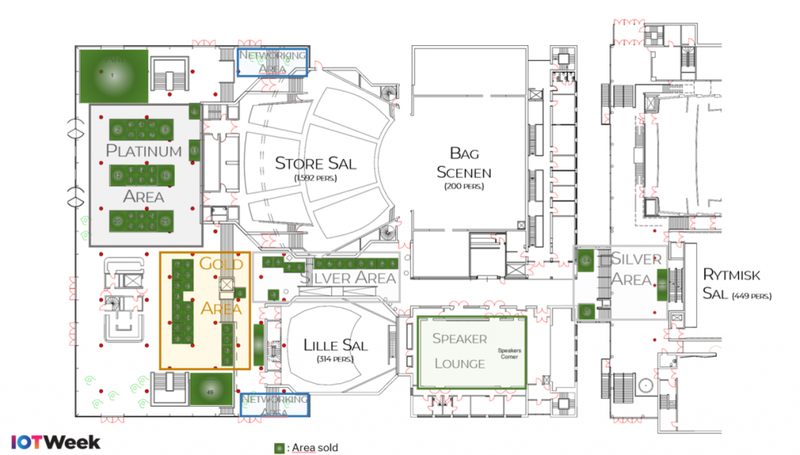 Exhibit space is assigned upon completed registration, on a first-come, first-served basis. Secure invaluable feedback. Showcase your latest work. Build brand awareness. Engage with potential customers and network with the most renown IoT experts. You can build your stand as large as you wish by combining the standard 2×2 modules. For special requests or inquiries please contact us directly at iotweek@itforum.dk. Extra materials such as: Screens, chairs, tables etc. Can be added by following link.